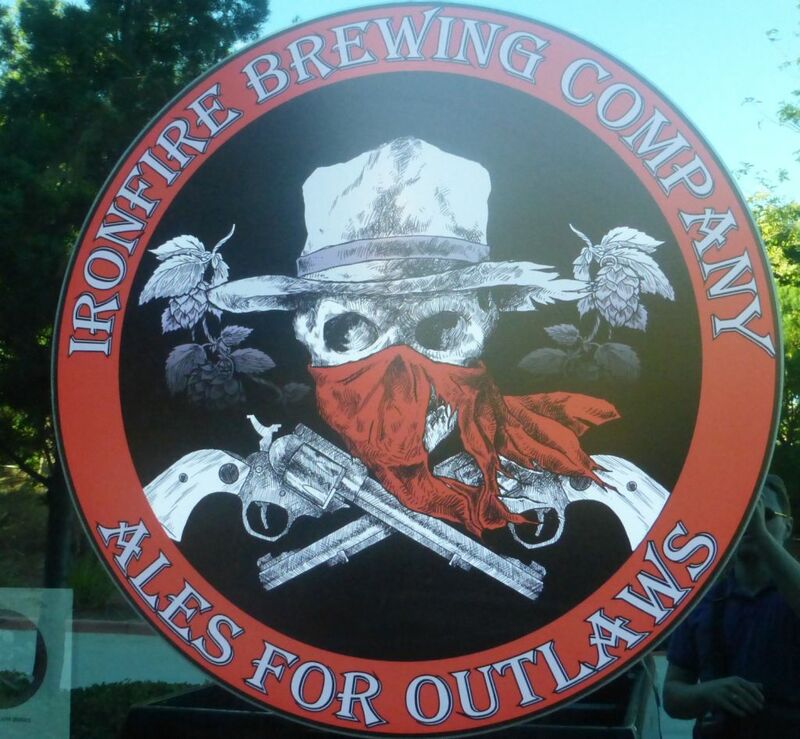 Ironfire Brewing in Temecula has some wide distribution so you might see a bottle or two in the store in San Diego. I stopped by to visit the brewery while I was driving through and got to try some of the beers I might have skipped if I saw them in the stores. The specialty beers I got to try were very nice but you should be able to find two beers, the 51/50 IPA and 6 Killer Stout in bottles around town. Visiting the brewery has the added bonus of a super cute female bartender. If you do decide to visit, know that it is easy to miss because the sign you see from the street sounds like a winery. There were too many beers on tap for me to try everything but I did get to try most of them. I had tastes of the 51/50 IPA, 6 Killer Stout, Vicious Disposition, India Pale Lager, Dead on Arrival Double IPA, and Double Chocolate Stout on Nitro. The lineup was quite impressive and I might be hooked forever on the 6 Killer Stout. The 51/50 IPA is much more bitter than any other single IPA I have ever tried. It had a nice grapefruit and citrus flavor going. Though I enjoyed it I think it was a bit too bitter for the flavors it had. I love bitter brews but this was a bit much. The 6 Killer Stout is an explosion of coffee flavors and uses coffee from a local roaster. Though not too heavy on the alcohol, this beer has some serious coffee flavors. The coffee had nice nutty and chocolate flavors. I was so impressed that I left with 2 22oz bottles of the stout. The Vicious Disposition is a stronger stout made with local avocado honey. This was a tasty beer that was very well-balanced, which is good because honey can sometimes become too much. Even if you haven’t enjoyed many honey beers, this one is still primarily a stout. The India Pale Lager was totally different than any I have ever tried. Not only is it not very bitter at all but it is also very light in color and body. It almost drinks like a light beer and yet it has plenty of grapefruit and tropical fruit flavors. The alcohol percentage hides very well here and you would never guess its percentage from drinking it. The Dead on Arrival Double IPA was a solid double with plenty of floral and citrus flavors. I also got a lot of tropical fruit flavors from it. It seemed like it went a little too overboard with the mosac hops though because it had a light soapy finish. Finally I tried the double chocolate stout on Nitro. The guys I talked to at the bar told me they found this one to be too boozy. I have to agree. Though I did taste some chocolate at the back end, it was masked by a heavy boozy flavor that was a bit too much. In the end, I would say there is a good reason why the 51/50 IPA and 6 Killer Stout are the big sellers because they are both fantastic. If you see either of them in stores down in San Diego, pick up a bottle if they sound like your kind of beer. Also known as Belgian wits (like the mass-produced Blue Moon), wheat beers get their lighter flavors from wheat malts that don’t have the same dark flavors or coloring as the malts typically used in a pale ale or a porter or stout. This usually leads to a brighter flavor in the beer and, when mixed with a Belgian yeast, creates the flavors you are familiar with in a Belgian Wit. Some brewers will add lemon or citrus flavors to these as well to brighten them up. Wheat beers are commonly unfiltered and also typically on the lighter alcohol content around 4.5%. Because of their lighter flavors wheat beers are not as common from craft breweries. Instead, many local breweries experiment with the style. Modern Times and Council Brewing both brew a hoppy wheat. They add a bunch of hops to a wheat beer to give it a citrus kick and some added flavor. These hoppy wheat varieties are still light in alcohol and just as refreshing. Local Favorites: Karl Strauss Wheat, Ballast Point Wheat, Modern Times Hoppy Wheat, Council Hoppy Wheat. The amber style of beer, sometimes known simply as a red ale, is best recognized by the reddish color of the beer when poured into a glass. While IPAs and pale ales are great for learning about the flavors of hops, ambers are great for learning about the flavors of malts. Malt flavors tend to be the primary draw and sometimes give a fruity flavor and other times a sweeter caramel flavor or a light roasted flavor. Most ambers tend to be on the lighter side, around 4.5%, and it is pretty rare to see imperial red ales in San Diego. The term imperial as used here implies that the beer is around twice as strong as usual. These stronger red ales tend to add more hops to balance out the more intense flavors from the malts. In the next part of this series I will explore the porter and stout beers. Introduction to Craft Beer Part 3 – What is a Pale Ale? One of the more common beer styles you see is the pale ale. Understanding this is important because IPAs are called India pale ales and are a stronger version of a pale ale. Most pale ales tend to be on the darker side and have a significant malt taste in the background. Malt flavors seen in pale ales tend to be more towards the bread and toast flavor. Frequently the toasty flavors come from roasting the malts themselves. Some lighter color pale ales use different varieties of malts that can give them a nice sweet finish while not overpowering the hops. Pale ales can be made with many different types of hops but typically have less hops than other styles so that the flavors are not as intense or bitter. Many pale ales in San Diego focus on the pine and floral hops. To understand these flavors think of familiar smells. The beers taste pretty similar. Pale ales tend to be lighter in alcohol, somewhere around 4.5%, with some stronger extra pale ales closer to 5.5% or even 6%. Many higher alcohol pale ales tend to be lighter in color. Local Favorites: Saint Archer Pale Ale, Green Flash Pale Ale, Karl Strauss Pale Ale, Stone Pale Ale, Helm’s Pale Ale, Alesmith X Extra Pale. Introduction to Craft Beer Part 2 – Why Drink Craft Beer? This is part 2 of a multiple-part series of posts that explain the basics of beer. In Part 1 I answered the question “What is a tasting room?” In this post I will explore what separates craft beer from mass-produced beer. Stay tuned for future posts on the various styles of beer. At some point in life you hear most people say “Beer is beer. Why should I spend much money on it?” It is apparent that you are spending a lot more money per beer when you buy a six-pack of IPA for about the price of a 12-pack of Budweiser. If you like the pilsner style of beer (which most mass-produced beers are), you certainly can’t be blamed for buying the cheap stuff. Though it might not be perfect, it usually does taste like a pilsner (unless you get the light variety). Craft beer is about transforming the experience from drinking to get drunk to drinking for the flavor. Just as people are more satisfied by a really fantastic slice of cheesecake than some grocery store cake, a really good craft beer tends to satisfy you much more than a Budweiser. Beer is a complex beverage that requires balancing a number of different ingredients to come up with the perfect flavor. Exploring craft beer is a way of learning to recognize the different flavors so that you can better enjoy your experience drinking beer. If you’ve ever gone over to a friend’s house only to be asked if you want an IPA, a porter, a pale ale, or an amber you might have replied “Dude just give me a beer!” It really is a lot more complicated than that and there are a lot of different flavors that you can taste in different styles of beers. The descriptions below may not be technically accurate but are written in a way that I hope will be understandable to the average person. Over the next few posts I will go into detail about the various styles of beer with local examples of each style listed at the end of each section. 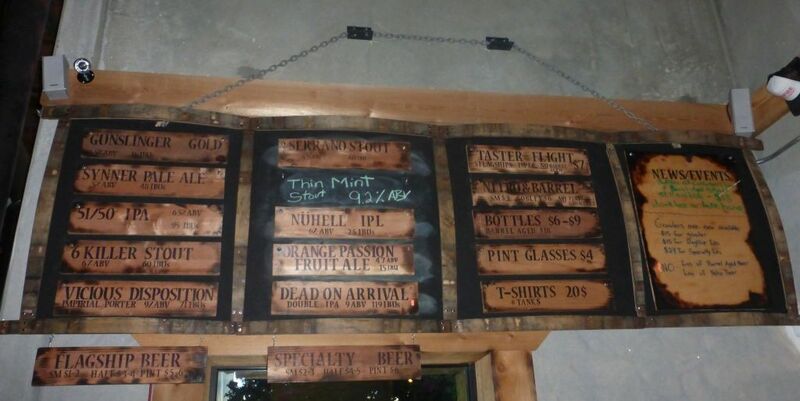 An Introduction to Craft Beer Part 1 – What is a Tasting Room? This is the first of a series of posts that will explain the basics of beer. Part 1 answers the question of “What is a tasting room?” In future posts I will explore what separates craft beer from mass-produced beer. After that I will explain some of the common styles of beer. If you are already a big beer fan, share these with your friends to introduce them to the wonderful world of beer. Every tasting room has a bar where you can order pints of beer or smaller glasses of stronger brews as well as smaller four-ounce tasters. 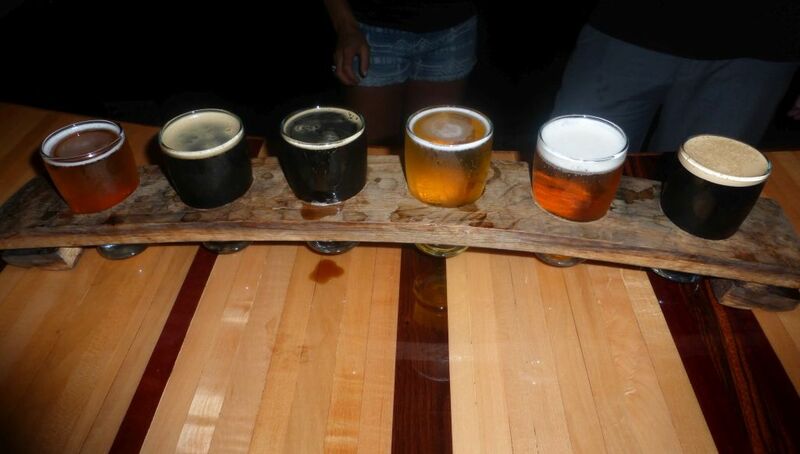 Traditional tasting rooms allow you to buy only one or two tasters while some brewery restaurants require you to buy a flight of five tasters. Most bars only serve full pints and usually have beer from a number of different breweries. 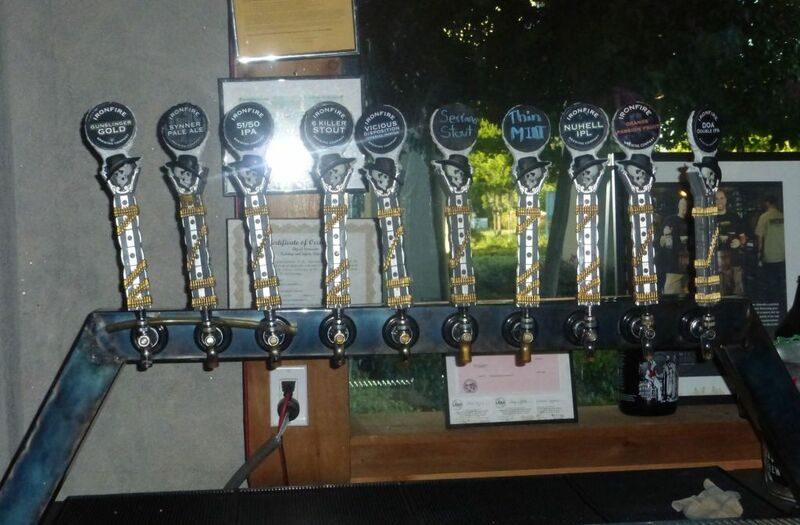 Tasting rooms usually only serve beer brewed by the brewery running it. If you already know the style of beer you prefer, it is usually best to stick to that style, especially if you plan on hitting more than one brewery. Though tasters are only four ounces, many breweries serve higher alcohol beer than you may expect. Tasters are also great if you are trying to decide what beer to take home in a growler. Growlers range in size from 32 oz to 1 gallon. These allow you to enjoy some fresh brew at home. The beer will stay fresh in the growler for over a week until it is opened. Once you pour a glass from the growler, it is best to finish the growler within 48 hours. Unless you are a heavy drinker or have a lot of friends coming over who share your tastes in beer, it is best to stick to a 32 oz growler so that you enjoy the beer fresh. Tasting rooms are usually more relaxed than bars and sometimes allow you to bring your dog and/or young child with you. Most tasting rooms do not serve food but food trucks are often on site to sell you something to eat with your beer. Check the web-site of the brewery ahead of time if you expect to eat because some have food trucks a few days out of the week. If they don’t have a food truck, most breweries do not mind if you show up with some food to enjoy with your beer. Stone, Karl Strauss, and now Ballast Point’s Little Italy location are restaurants where you can also enjoy their beer.